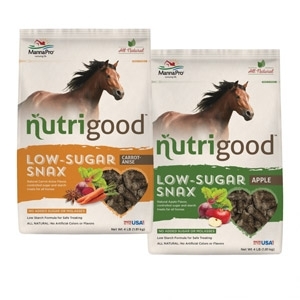 We pack a lot of goodness into our nutrigood treats. All-Natural ingredients. Irresistible, natural apple or carrot/anise flavor horses can’t resist. The peace of mind that your horse isn’t getting extra sugar and starch he may not need. Low-Sugar Snax are great for all horses, whether they need a controlled sugar or starch diet, are overweight, or if you simply like to feed less sugar. There is NO sugar or molasses added to our formula, ensuring no more than 6.5% sugars, which are present naturally. Low-Sugar Snax are more than good, they’re nutrigood.